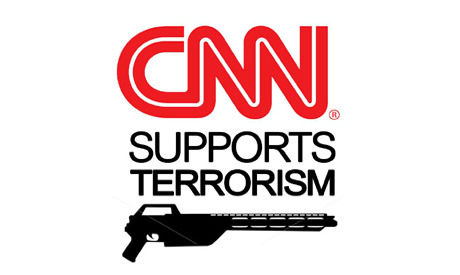 The Facebook photo of a new Egyptian page titled "CNN Supports Terrorism", criticizing the international channel's saying Morsi was ousted via a coup, (Image: Facebook). Leading US television channel CNN has come under severe attack by Egyptians on social networking sites, accusing the channel of bias against events unfolding in Egypt. After millions took to the streets across the country on Sunday for a planned demonstration calling for early presidential elections, the military intervened to oust president Mohamed Morsi after he refused to fulfil the protesters' demands. The intervention was immediately dubbed a coup by the then-ruling Muslim Brotherhood, the group from which Morsi hails, who have been demonstrating in the hundreds of thousands in his support. The characterisation was shared by CNN, whose coverage of events was subtitled, "Coup in Egypt: Military ousts Morsi." Opponents of the president refused the categorisation. "It's a revolution, not a coup," said a Facebook page launched Friday entitled, "Obama supports terrorism in Egypt." The group quickly gained over 35,000 subscribers. The opposition, who filled the iconic Tahrir Square and surrounded the presidential palace in Cairo last Sunday, are generally pleased with the army's move. The political "roadmap" set forth by the army was agreed upon in discussions with the opposition. The roadmap included instating the head of Egypt's High Constitutional Court as interim president and forming a technocratic government until early presidential and parliamentary elections are held. The roadmap was identical to the one called for by the anti-Morsi 'Rebel' campaign, the signature drive signed by Egyptians demonstrating on 30 June. For this reason, many were infuriated by CNN's insistence on dubbing what happened a "coup," accusing it of backing US policies in support of Morsi. On Twitter, the hash-tag titled #CNN_STOP_Lying_About_Egypt trended in Egypt, showing the extent of antagonism that has grown against the channel. Journalist Bassem Sabri posted the CNN logo emblazoned within the emblem of the Muslim Brotherhood as a sign depicting the channel's perceived adoption of the Brotherhood line. The Brotherhood, for its part, immediately condemned the military's move, accusing it of overthrowing a legitimately elected president. The ousted president's supporters, outraged at Morsi's ouster, took to the streets in Cairo and several other cities carrying pictures of the president, who is detained in an unknown location, and demanding his release and reinstatement. One of the pro-Morsi rallies made it to Tahrir Square, where an anti-Morsi demonstration was being held, leading to clashes that left many dead. Armed clashes between Morsi supporters and opponents erupted in many cities – some of a sectarian nature in Upper Egypt –after the Brotherhood Supreme Guide Mohamed Badei made a speech at the supporters' main rally on Friday urging them to remain peaceful. The violent events of Friday night added fuel to the fire, prompting Twitter users to react and use the anti-CNN hash-tag to accuse the US of supporting violent groups. "#CNN_STOP_Lying_About_Egypt where do u stand on the attacks against churches, Copts right now by MB and their Jihadists in Upper Egypt today," Egyptian film director Amir Ramses tweeted. "A terrorist carrying "Al Qaeda" flag killed 2 boys! These are the kind of people #Obama supports! #CNN_STOP_Lying_About_Egypt #not_a_coup," Twitter user @anisem001 said. He shared a video – recently gone viral on Twitter and Facebook – allegedly showing Islamists brutally throwing two teenage boys off a tall steeple on a roof during Friday's clashes. One of the attackers wore a long beard and was carrying the famous black Al-Qaida flag. The video was shared on CNN's official Facebook page, which was riddled by statements by users insisting what happened in Egypt was a revolution not a coup. "It's a revolution not a coup ... the people wanted him out and the military responded to the crowds ... [Morsi] was not a successful president ... he did not represent the people of Egypt ... the masses wanted him out and so he is out ... it was a revolution," Nelly Ashraf Ghazy wrote on the CNN's wall. The 'Rebel' campaign is calling for mass protests on Sunday to support what it said was "popular legitimacy." The campaign called for mass protests on its official Facebook page, asserting that "there are clear attempts to distort our glorious revolution, attempts to depict popular will as a military coup which could lead to intervention by foreign powers in Egypt's internal affairs." The president's supporters and the Muslim Brotherhood's Freedom and Justice Party (FJP) insist Morsi is still president. "We will not leave the streets or squares of all #Egypt except when we r carrying our elected legitimate prez on our shoulders back in prez office [sic]," the FJP's Gehad El-Haddad asserted on Twitter. NOT a Coup CNN !!! !wake up this is a Revolution against Terrorism ! This UNDEMOCRATIC COUP will backflash in the face of everyone who thought that Egypt needs army or dictators. .The promorsi demonstrators are not going back to the dark ages of cheating,betrayal,twisting,corruption and fraud and will resist even with their lives.That s the only way.And if the egyptians are affraid of islam then I suggest to take lessons to learn how fair our deen is .Its not a islamic name and pray and ramadan that makes you a moslem it s a 24 hr lifestyle people. CNN is rubish they always push things. We all know this here in the west. Not only egyptians made theire comments on CNN people from all over the west . You move on, go your way. God help you all . Do not blame the Moslem Brothers or the islamists for winning all the past elections (and also the next ones) You would then blame Democracy that brought them in authority. You would blame the majority of the Egyptians who said YES to the Islamists. What happened in Egypt is A MILITARY COUP What happened is a counter-revolution against the June 25 one. Morsi is an anti corruption plan founder in Egypt and that’s why he was ousted.